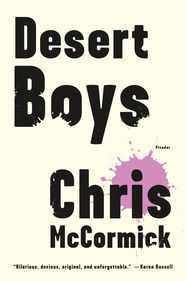 The following is from Chris McCormick’s collection of short stories, Desert Boys. Chris McCormick was raised in the Antelope Valley. He earned his B.A. at the University of California, Berkeley, and his M.F.A. at the University of Michigan, where he was the recipient of two Hopwood Awards. He lives in Ann Arbor. Desert Boys is his first novel. We each carried a plastic grocery bag and a club. Karinger’s was an old 3-wood—so old, it was actually made out of wood, except for a little metal plate across the top of the head that had the number 3 painted on it in red. Mine was an impossibly long 2-iron that had a face as flat as a ruler. Karinger said even pros couldn’t use it right. Sometimes when the wind was low and if I got a ball that wasn’t cracked or yellowed, I could hit it pretty well. Problem was, the only golf balls we found in the desert by the old course had been lost there for a while. Some looked so old, they seemed just as natural as the California junipers. Good white golf balls were so rare, Karinger made me feel bad for using them. “We can sell them,” he’d say, but we never did. We’d been ball-hunting out there for ten days straight. Karinger said he hadn’t seen anyone on the old golf course in a year. He had the idea to collect balls and take them to the new golf course on the other side of town, where crowds swarmed and the grass was kept nice. With the balls we collected in the desert and the clubs Karinger’s dad left behind, we could hit on the range there for free. It was something to do. The walk was a slog, though, and sometimes I’d pretend I didn’t see balls in the tumbleweeds that I normally would’ve gone for, just because my bag had already gotten so heavy. “I’ll get them tomorrow,” I’d tell myself, but it was always harder to find a ball I’d already found and let go. One time, Karinger reached into a dry bush for a ball that was lodged in there. From about a hundred yards away I heard him scream, so I ran over. I was going to ask what happened, but I saw it myself. Craning over a sharp yellow bush, a rattlesnake sat up like they do in movies. Karinger said in a whisper he didn’t get bit, but it was close. We got out of the way, just in case. Karinger took his 3-wood and nudged the snake until it hissed. “Let’s leave it,” I said, but Karinger didn’t listen to me. He took a huge backswing and almost hit me in the face with his club. Next thing I knew, he was drumming the snake’s head and body into the hard white dirt. I felt bad for the snake, but I hit it, too, once it stopped moving. On the way home, Karinger straddled the yellow dashes of the empty highway. I walked in the dirt on the side of the road, using my club as a walking stick. Lizards raced before my feet, and once in a while I crushed a Pepsi can with my shoe or else knocked a plastic water bottle into the tumbleweeds with my 2-iron. The plastic bags, filled with old golf balls, hung from our wrists. Before I met him, Karinger walked five miles home from school. Mom would pick me up, and every day on the drive back we’d see this chubby blond kid walking in the desert with a big backpack and a huge T-shirt darkened with sweat around its collar. One day after school, Mom drove me to a clothing store on another side of town. There he was, still walking, slower now, an hour and a half after school got out. Mom pulled the car over and told him we would give him a ride. From then on, we drove him home after school. Of course I knew who he was: we were in seventh grade together. He wore old oversized T-shirts every day. From his face grew the ugly blond beginnings of a beard, a feat at school accomplished only by a Filipino eighth-grader. Karinger never talked in class, and I’d never seen him talk to anyone outside of class either. He was always alone. I usually spent my time at school alone, too, but at least people knew I could speak because I raised my hand a lot in class and answered questions. In fact, in the beginning I heard him talk only when my mom asked him questions in the car. Once she asked him why he walked home in the heat. Karinger didn’t tell her it was because his mom worked all day and his dad was gone. He told her he liked finding things in the desert. He started to come over to my house to play video games. We jumped on the trampoline in my backyard, jumped from the trampoline into the pool and swam all day. 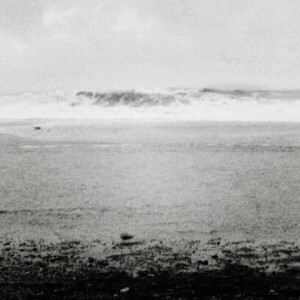 One time we’d been floating out there for a long while without saying anything to each other. I surprised myself by asking if he was jealous of my house. My parents both worked full-time; we weren’t well-off. But I knew he lived in a trailer. “You ever drink the water from a cactus?” I hadn’t. He went on and on about the desert and all the equipment his dad had left behind. He told me about the golf clubs and the abandoned course. By the end of his speech, I was so excited, I asked my parents if I could go to Karinger’s place after school. Later, his mom called mine and said, “You’ve got no idea how important your Daley is to my Robert.” Then it was summer, and I was at Karinger’s all the time. Karinger’s mom, Linda, did two things: She worked fifty-five hours a week at Antelope Valley Animal Shelter, and she entered sweepstakes. Scattered all over the floor of the trailer were losing scratch-off tickets. Walking between them on the carpet, my feet picked up their shavings. If Karinger had shaved and worn a long blond wig, he’d have looked just like Linda. She even wore baggy T-shirts, too. After working at the shelter all day, she’d come home to Karinger, his younger sister, Roxanne, me, and the three cats living in the trailer. I couldn’t tell if the shaggy brown carpet smelled like the cats or if the cats smelled like the shaggy brown carpet. Either way, Linda had that smell, too. One time, Karinger and I cleared a patch of that spotted carpet and sorted our golf balls. We put newer balls in one pile and scratched or warped ones in another. That’s when Karinger told me we should sell the good ones. Linda was standing in the room, rocking a big brown cat named Potato in her arms. “Why don’t you tell Daley your real plan,” she said. She had a smile on her face like a kidder. Potato leaped from Linda’s arms and into our golf balls. She batted them between her paws and messed up the neat piles. Karinger hissed at the cat. “Get out of here,” he said. Roxanne stepped over and scooped Potato up from underneath. She flattened the cat’s face with her open palm and made funny noises. “You’re mashed, Potato,” she said. She giggled and squeezed the cat tight. I laughed, too. Karinger rolled his eyes. He made a gun with his finger and thumb and pulled the trigger at the side of his head. “Boom,” he said, and flopped dead on the floor. A few times a year, Linda brought kittens home from the shelter in groups of six or seven. They’d stay at the house until they no longer needed to be bottle-fed. Sometimes the batches overlapped. Sometimes there’d be thirteen or fourteen kittens living in the yellow bathtub. Once in a while, one of the kittens would die. When this happened, Linda wouldn’t bury the kitten nearby, even though Karinger asked her to let us bury it in the desert out back. “I can make a cross out of some twigs and we can say something nice,” he’d say, but his mom wouldn’t budge. She’d get rid of the dead kitten some other mysterious way. She told us not to name the kittens. No use in getting attached, she’d say. Karinger did anyway and named them based on their colors. Black kittens were called Midnight or Oiler. He called orange ones Tangerine or Carrot. One time, Linda brought home a black and orange kitten and I suggested we call him Halloween, but Karinger said no. “That’s too easy,” he said. I wanted to point out that calling a white cat Snow White wasn’t exactly difficult, but I just shrugged. After a little while, Karinger said we could call the kitten Halloween, just until he thought of something better. He never did, and Halloween, like the rest of the kittens who survived, eventually went back to the shelter with Linda. The boulder looked real to me, but I didn’t argue. Toward the end of the packed driving range, we found two empty slots. When we set down our bags and clubs, Karinger knelt down and brushed his hand against the grass. “Not Astroturf,” he said. In the grass we collected broken tees. They were wooden and colorful and left behind by real golfers. Some of them still had enough length to stick into the ground. A few of them had tops that were still intact enough to balance a golf ball. Once we found enough, we emptied our plastic bags onto the grass. Karinger had about fifty old balls and I had maybe half that. I got through mine with one swing per ball. My shots rarely got off the ground, but some of them rolled pretty far, spitting up dust like a car in the distance. I turned to see how Karinger was doing. I expected him to have a few more left to hit, but he hadn’t even made a dent. He teed up and took a few more slow practice swings. He stepped up to the ball and placed his club behind it. He looked out into the targetless field for a long while. Then he brought the club back and around. He lost his footing on the way down and barely made contact. The ball dribbled a measly fifteen feet into the grass. “Redo,” Karinger said. He jogged out into the field to re-collect his miss-hit. Just as I was about to tell him he needed to hurry up, a man a few slots away in a Crocodile Dundee straw hat yelled out, “Kid, get back behind the line!” I hated being scolded, and even though Karinger was the one getting yelled at, the fact that I was with him made me nervous. “Sorry,” I said to Crocodile Dundee. “Sorry,” I repeated. Karinger didn’t say anything. The man tipped his hat and went back to his slot. “I thought he was pretty nice about it,” I said. “You really shouldn’t have gone out there. It’s dangerous.” I pointed to a sign that said so. “You need help finishing your pile?” I asked. I hoped he would say yes so we could get on our way. “No,” he said, “I’ll be quick.” He went over to his slot and without much of a wait started hacking at the pile of golf balls. Some of them shot out at strange angles, but most of them hardly moved. He was chopping at them with his club. The 3-wood ripped hunks of grass out of the ground, leaving wet, muddy holes. Chunks of turf and mud splattered all over Karinger’s pants and T-shirt. Crocodile Dundee and a few other men ran over, yelling. Karinger, holding his weapon, grabbed my wrist with his free hand and we fled. “Sorry!” I yelled out as we ran. On the way home—through the desert, to avoid roads—Karinger didn’t say a word. “What kind of name is Kallie?” Karinger said. He looked at the kitten while he asked his sister. “It’s short for Kaleidoscope. She sort of looks like one.” She bent over to put her face near Kallie. “Don’t you?” she asked the kitten. “That’s stupid,” Karinger said. He let the word hang there for a second, and then left the bathroom. “Guys?” Linda peeked around the door at us. “Where’s Robert?” “Being a baby in his room,” said Roxanne. “Go check up on him,” Linda told her daughter, who, groaning, obliged. Linda and Roxanne traded places, and before I could feel the awkwardness of our standing in a small bathroom together, Linda began to talk. I thumbed between the kitten’s eyes. I was nervous that Karinger was going to come back into the bathroom and discover his mom telling me his secrets. I decided I could only stay another minute. She paused for a moment. When she continued, something in her voice had changed. I kept on with the kitten, afraid to look Linda in the eyes. The year before, I’d been a businessman—a neighborhood landscaper. I’d negotiated wages, for God’s sake. Now I’d regressed to the point of looking to a kitten for strength. Karinger was to blame, but I wasn’t sure how. Karinger kept playing. His mouth was open and his eyes were watering. He hadn’t blinked in a while. I asked him again. That last part was true. In the desert, it takes a certain knowledge and work ethic to keep a lawn green. One skill my dad taught me was how to maintain a desert lawn, how to keep the mower’s blade high. Too short and you can burn the grass at the roots. I never told Karinger any of that. I felt guilty talking about my dad when I was with Karinger, so when I was, I pretended our dads abandoned the Antelope Valley together. “You can leave, too,” I said. “Don’t you want to?” And as soon as I asked, I knew the answer was no. “Let’s go make that apology,” Karinger said. He stood over me, backlit by the lamp in the ceiling. “Robert,” I started, but I didn’t really have anything to say. I didn’t want to walk over to the golf course in the middle of the night. I got up and put on a sweater. I was about to leave the room when I noticed Karinger had his 3-wood and his grocery bag in his hands. I asked him why he was bringing his equipment. I thought of Crocodile Dundee yelling at us for retrieving bad hits. I had to admit it would be fun to be out there alone, with an infinite number of chances to hit a good shot. “Don’t forget your stuff,” he said, and I didn’t. “I can’t,” I said. What I had meant to say was: What’s the point? There was nobody there. No groundskeepers, no Crocodile Dundee. “Your turn,” he repeated. I climbed onto the rock and up to the top of the gate. Falling from there to the cement on the other side was the hardest part. Karinger reached up and I reached down. He helped pull me to the pavement. When I landed, I still held on to him. My feet rang like my hands sometimes did when I hit a ball in a weird place on the club’s face. It stung a bit. It didn’t hurt as bad as I thought it would. Some of the smaller lights were still on, but the large stadium lights down the field were all shut off. Huge sprinklers showered the grass two hundred yards out. “I’m going to leave now,” I said. “Don’t,” Karinger said. I thought he was going to continue. I thought he was going to try to bully me into staying. I thought he was going to call me weak or lame or gay. But he didn’t. He just said, “Don’t,” and stopped there. We found the giant muddy divots he’d carved out of the ground earlier. In them was a sandy mixture of seeds and dirt one of the groundskeepers must have planted. Karinger put down his grocery bag and took slow practice swings with his 3-wood. I did the same with my club. “Let me have a ball,” he said, and I tossed him one from my bag. I didn’t even ask why he didn’t use one of his own. He put his club behind the ball and took a quick swing. The impact sounded solid. The ball shot off into the dark, disappearing among the stars before we could see it land. Karinger was still holding his stance, the club over his shoulders. “Really,” I said. “That was awesome.” I shivered even though I was wearing a sweater. Karinger stood there in a T-shirt like a trophy. Then he pulled his club over his head and hammered away at the grass again with everything he had. Karinger threw his club away into the field past the safety line and fell to his knees. He started clawing at the mud and grass with his bare hands. He stretched his arm out to snag his plastic grocery bag. He started to dump its contents into the hole he’d made. Whatever was in that bag, he planned to bury. I thought, Kallie could fit in a bag like that. With both hands, I lifted the 2-iron over my head. For a second I believed I might actually bring it down on Karinger’s skull. But he emptied the bag, and what fell out—all the good white balls we’d collected—toppled into the hole, one on top of the other. “Oh,” I said, dropping my 2-iron. Karinger gathered the strips of mud and grass he’d unplugged from the ground. He placed them over the golf balls in the hole. He pressed with both hands and all his weight. “Help me,” he said. He was crying—the first and last time I’d ever see that. I put my hands over his and we pushed the mud down together. For some reason I started crying, too, and the shame of that only made it worse. No matter what we did or told ourselves for the rest of our lives, this moment revealed the truth: We were not tough boys. When the ground was as flat as we could make it, Karinger got up and walked over to pick up his wooden club, which he broke over his knee. Out of the broken shaft he made a cross and laid it over the mound. He said, “This is the last I’ll ever mention him,” though that wouldn’t, of course, turn out to be true. Then Karinger spoke to his father under his breath, and I couldn’t make out the words. The sprinklers came on and we dashed out from the grass toward the gate. It didn’t take long for us to realize that without the boulder, we wouldn’t be able to hop over the fence and make our escape. The night was cool, cold because we were both dripping wet. Maybe we could have laughed, but we didn’t. Karinger stood with his head down and his eyes closed. I stared at him. In his baggy shirt, which was even bigger now that it was soaked, he looked like a kind of monk. We were quiet for some time. Then the east lit up, and we waited for men to open the gate. From DESERT BOYS. Used with permission of Picador. Copyright © 2016 by Chris McCormick.